An honor-bound Knight of lore versus the 5-headed dragon-goddess of evil, Takhisis. What more could you ask for? Sometime around age 10 or 11, I was turned on to my first Fantasy novels by some friends. DragonLance — The Legend of Huma, by Richard A. Knaak, to be exact — was my introduction to the genre, so that setting became my bread and butter and I soon devoured nearly every title under that banner, though RavenLoft, Forgotten Realms, and even the odd Greyhawk, Spelljammer, or Dark Sun paperback crept its way into my hands. Published by TSR, Inc. (you know, those D&D people before Wizards of the Coast), the DragonLance novels were commissioned to help realize the world and lore of the company’s role-playing game campaign setting of the same name, which included adventure modules, board games, and miniatures. Starting with Weis & Hickman’s Chronicles trilogy, the shared-world milieu eventually boasted over 150 novels by dozens of different authors (we won’t bother to mention the horrific animated film…). Anyways… the point is, grounded in fantasy role-playing games, these novels lead my friends and I, naturally, down the path of trying our own hands at Dungeons & Dragons. These sessions were few and far between — for the most part, this all coincided with the advent of the collectible trading card game Magic: The Gathering’s popularity around 1994’s Revised Edition — and eventually petered out as we grew older and drifted apart (both geographically and socially). 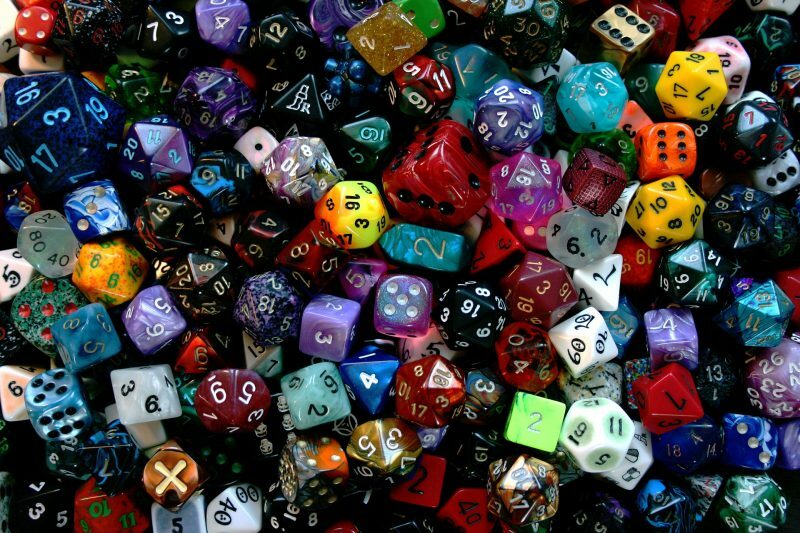 The seed was planted, however, for my life-long love of the fantasy genre, role-playing games, science fiction, and most other associated geekery. I’m all grown up now, nestled into a family, a mortgage, and a life of responsibility (we even have 3 entirely worthless cats, whom I love) — an “adult”, if you will — and aside from a few random Shadowrun, Warhammer, and World of Darkness sessions with almost-friends, tabletop gaming faded away into one of those nostalgic things I’ve always wanted to be involved in, but just didn’t appear to be in the cards for me, so to speak. For a long time in my teens and early twenties, I was anti-social, so face-to-face gaming was something I avoided, but console, computer, and — starting around 2001 with EverQuest — Massively Multiplayer Online RPGs were a large part of my life. Eventually, even they, too, would fall to the wayside as I crossed paths with my soon-to-be wife, returned to college to achieve my Computer Science degree, joined the corporate workforce, and started spawning children. While my love of fantasy and role-playing games hasn’t abated, it’s always taken backseat to responsibility, to the point that I just stopped trying to log into online games, since multi-hour sessions were out of the question, and even finding time to complete a single-player game, which could span over 100 hours of play time, seemed entirely infeasible. 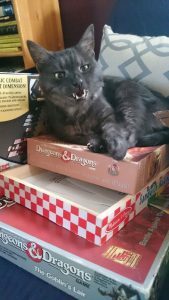 Dungeon Cat prepares to attack! I’ve described my epiphany already on my About page, but basically, I realized one day that my kids, ages 3 and 4, were old enough to start grasping higher-level concepts that would go along with tabletop games — especially role-playing games, since what, essentially, is an RPG besides pretend play with rules? Kids are natural masters of that! Well, maybe not the “rules” bit, but I decided to try it anyway. I don’t recall what my first search terms were, but Kids Dungeon Adventure by Ben Garvey was the first thing I saw. I thought, “$5.99 can’t buy much fun in the real world, so let’s see what Ben’s got to offer my kids from the fantasy realm”. I liked what I saw, also pulling some elements from NewbieDM.com’s rpgKids ($3.99), and before long I’d played through my first role-playing game session (as Game Master, of course) with two preschoolers. It was really, really great (and I’ll soon try write up our adventures here for you to read). I loved it so much, that even after the kids had their fill, I kept digging deeper and deeper, reading rule sets, watching YouTube videos of Critical Role, dreaming of a way I could fulfill a more complex, possibly adult-themed, role-playing session that I’d secretly yearned for since my last D&D session with my friends as a preteen. The pen & paper RPG flame was re-lit inside me, but given that whole “adult” business, I quickly became dismayed at the thought of never achieving a real play session, which typically takes 3-4 hours, much less the regular get-together with the pals, hacking our way through a weekly campaign installment that could span the course of months or years. Not to mention, everyone I know is similarly positioned in life, so their aspirations for such child-less things as a regular game group are also hampered. The concept of Play-by-Post games came across my radar one day in the Beginner’s Guide [to Role-Playing Games] on the /r/rpg subreddit’s wiki. My interest was piqued. This sounded like something I could get into — asynchronous, location-independent, pen and paper role-playing online without the social anxiety of sitting around a table full of geeks pretending to be a warrior. I checked it out some, and still want to give it the old college try to experience it for myself, but it largely seemed like most games ended in frustration as players lost interest or life got the better of them and they couldn’t post for a time or were just dipping their toe in the water, any of which being the catalyst that brings down the whole house of cards. While I yearned for that pen & paper role-playing fix, I wanted it to be a good experience, not a depressing one likely doomed for failure. Something that I could keep coming back to, on my own schedule and terms, whenever and wherever the intersection of interest and free time might present itself. Then, I found “solo play”, or more formally, solitaire, role-playing. If you know anything about it, then you probably had the same thoughts new readers are having right now: how do you play a role-playing game — intended for at least two people (a Game Master and a Player) but most times aimed at a Game Master and group of 3-6 players — by yourself? Technically impossible, you say? Or maybe you’re picturing a really weird dude in his mom’s basement making his way through each seat around a fold-out table, giving his best “fantasy” accent to an empty room as he portrays multiple characters in conversation before getting another handful of Cheetos? Luckily, it’s not as crazy (or weird) as it may seem. It’s entirely possible, and you might even enjoy it, if not employ it as a tactic for testing out new games or scenarios before unleashing them on your friends. And now I’m here, with this website, writing about it. I’m new to solo play, and new-again to role-playing games, so my hope is that if you’re just discovering solo play as well, you can follow along with me as I learn. Or, if you’re a parent, older sibling, aunt/uncle, or any sort of surrogate authority figure to some kids that you want to get started in role-playing, I hope I can share my experiences to your benefit as well. As I’ve said before, I think these two topics of family and solitaire gaming will really come together for a lot of people as they have for me, so my objective is to cover both topics, including role-playing games and any other tabletop, board, or card games and ideas for enjoying them both by yourself in your limited free time, or bringing your your family together around a table for some much-need (hopefully disconnected and offline) quality time. Roll the dice, and enjoy the ride!